• Any player level 10 or higher can accept the "First Pet" quest. • You can get the quest from the Newbie Guide in the suburbs and submit it to the Pet Master to claim a Flower Pixie Egg or a Minotaur Egg. • Right click the Egg and you will obtain a Flower Pixie or a Minotaur. Open the Pet Panel to view the pet's information. • Capturing pets in the wild is an alternative to purchasing a pet from the Item Mall. Unfortunately, it can be tiresome, and capturing tools (that break regardless of success) should be equipped in advance. • Baby pets are available at various locations at various times. Keep an eye on announcements on World Chat to find them. Possible locations to find them include the suburbs of Athens and Sparta, Marathon, Parnitha, Megara, Argolis, Nemea, Peloponnesus, and Medusa Island. Keep in mind that a capturing tool will come in handy. • When a pet is successfully caught, you can release the pet by right clicking the corresponding egg in your storage bag. • Place the pet in one of your two pet slots. You can purchase more slots in the Item Mall. There is surely an easier way to come by those cuties. 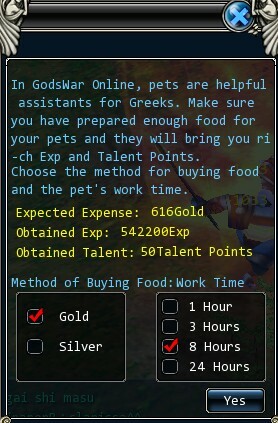 A variety of pets are available in GW Item Mall, at reasonable price. Head to in-game Item Mall for your favorite pet! Every owner gets one free chance to rename a pet. 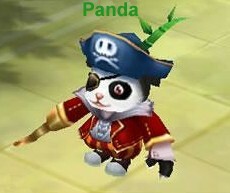 There are many different pets to select from, such as a Flower Pixie or a Panda. Pets have different diets, and owners should feed accordingly. It reflects the advantages of various pets. The color on names can be a good determinant, much like that on equipments. Owners can sign Soul Contracts with their pets which will enhance the advancement of their pets’ ability. The pets will become nontransferable. All talents are predetermined and they cannot be learned. Skills help strengthen pets and they can be learned. Try to keep this number above 40 to avoid unanticipated call backs. It is determine by the bond between the pet and its owner. Keep it above 40 before attempting to merge. The lifespan of any pet is predetermined, but it can be extended with the use of Effective Water. The Gender of the pet. The current accumulated EXP for the level. The total EXP needed to advance to the next level. Constellation of a pet is determined at birth, and it comes with many surprises. The number of merges succeeded. The number of rebirths taken. The number of rebirths left. As the rank increases, the pet’s skill will receive extra bonuses. One of the six savvies，affects Max MP, magic attacking power, and reflexive damage when combined. One of the six savvies，affects Max HP, physical defense, and life absorption when combined. One of the six savvies，affects hit rate, physical attacking power, and magic defense when combined. One of the six savvies，affects dodge rate, physical resistance, and magic resistance when combined. One of the six savvies，affects Max HP, physical advancement, and Decrease critical damage when combined. One of the six savvies，affects damage absorption, magic advancement, and reflexive damage when combined. Note: The strength of a pet's ability is determined by its savvy and growth. Note: Pets with an amity or life value of zero, or a Satiety value of less than 40 can not be called out. • Soul Contracts are offered to pets and their owners. Each pet will have one chance to sign a Soul Contract with its owner to enhance its abilities. Contracted pets can be traded using the Seal Jade(empty), but the contract will expire during the process. • Call out your pet to sign the contract. With the use of a contract spirit (5 maximum), the pet's basic values can be increased considerably. With your summoneded pet, visit the [NPC]Pet Manager in the major city and select "Pet Raising." Then, select "The pet and its owner are bound" to initiate the binding process. • All pets that are caught or purchased from the Item Mall are transferable, provided that the pet has not bound. Pets hatched from eggs that are rewarded from quests can not be transferred. • Bring your qualified pet, along with a Seal Jade <empty> to a Pet Manager in one of the main cities. • After talking with the pet manager, select the "pet raising" option, and then the "seal spirit" option that follows. This will pack away your sealed pet. • You can use the Seal Jade <packed> to trade the pet to other players. Right click the Seal Jade to release a sealed pet. • The pet's growth values are invisible to the owner until now. 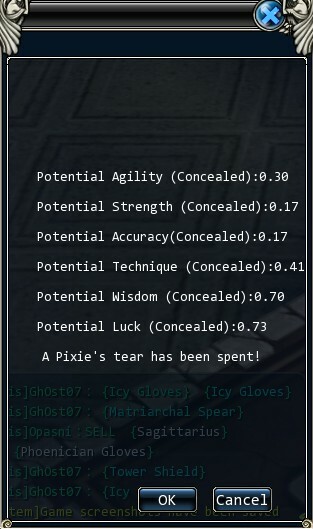 Pet owners have the option of viewing this information by going to a pet manager with a Pixie's Tear. • When a player kills a monster, the pet that is out will receive EXP as well. Ideally, the pet will grow with its owner. • To merge pets, the qualified pets must be taken to a pet manager. After talking to the pet manager, select "pet raising" and then "merger", and insert the pets accordingly. The deputy pet will be sacrificed in the process. 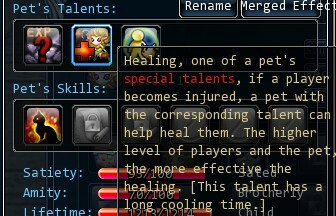 Through the use of a merge spirit, the pet's initial values can be increased. • The merging process will have no effect on nature, talent and skill of the pet. • Reborn pets get accelerated growth (concealed). There is a level requirement to make a pet rebirth possible. The first rebirth requires lvl 50, while the second lvl 80, the third lvl 100, and the fourth lvl 110. Lvl 120 is the requirement for the fifth as well as thereafter rebirth. Reborn pets will start form lvl 1 with added Savvy values reset to 0. The extra levels will be in a way converted to Exp, when your pet exceeds the level requirement for a rebirth. You have a choice to insert the Rebirth Spirit (5 at most) to get additional value for your pet. Notice there is a requirement item named Rebirth Water to perform any rebirth at any point. 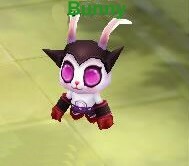 You will see a big (and incredibly adorable) difference in your Pet's appearance after the 8th rebirth. Newly added clean slate feature for pets to start their 6 savvy values anew using the Fairy's Feather. However this has no effect on initial savvy values. But after pet's savvy values are reset, greater attributes could be added to pet's master upon the merge of pet and master thereof, if luck may point its fickle finger to you. Fairy's Feather is available for purchase in the Item Mall. • Pets often bring their owners a world full of surprises. When called out, pets have the ability to pick up things, such as money or items, the owners would ordinarily miss. They also have the ability to give their owners additional EXP with their monster-kills. • Each pet is charged with the duty of protecting and serving its owner. It will recover the HP of its owner when it is absorbed. The higher the level of the pet and its owner, the more HP that can be restored. • This is a special genius that belongs to pets. Players can have their characters merge with their pets. In the merged state, their abilities will enhance quickly, and they will have a beautiful appearance and some cool special effects. • Players who are offline can receive a great amount of EXP and Talent Points by sending their pets off to work. All they have to do is select the work function from the pet's menu. A pet's working hours are determined by them. In this sense, players are paying pets to do their work, and both sides benefit. A termination function has been added to pet's work, and a working pet can be called back using the icon on the upper left corner (any unfinished work will receive 20% of the compensation). • Players can find the "Send Quest" button below the quest menu (shortcut Q). Send the pets to complete quests by using a magic bell, and you will get rewarded instantly. After the quests are completed, the pets will return. • Pets can learn up to six skills. Most skills are available for purchase from pet merchants.To learn a skill can be a two-step process. First, a skill slot must be activated using a bottle of Pet Enhance Spring. Then, the skill can be unsealed using a bottle of Golden Apple Juice. Just keep in mind that most skills are pet-specific or level-specific. Level 2 and Level 3 Pet Skills are now available. From now on have your pet learn these new skills by killing elite monsters and bosses in the new map - The Battle of Lelantine Farm. • When the six available skill slots are taken up, outdated skills need to be unlearned. Using a bottle of Strong Purge Potion, players can visit any pet manager, and after talking to them, select the "pet raising" and then "unlearn a skill" to make the pet free up the skill spot. There are two different types of purge potions, strong and weak. The difference between the two is that strong purge potions can be used to unlearn a designated skill, while weak purge potions can only be used to unlearn one random skill. A Weak Purge Potion can be used without visiting a pet manager, but the setback of using a Weak Purge Potion would be unlearning a skill that might actually be useful. We hope this guide provides you with all of the information you will need to get started! Good luck, and have fun with those pets!! !